Suitable for special occasions or every day wear, Sandy Feet Jewellery has been designed with you in mind. ﻿Nature inspired, by sun, sea, sand and smiles. Whether its yachts on a sparkling sea, happy childhood memories or an afternoon stroll through a fragrant garden, the local environment plays a significant role, from conception through to jewellery design. Real leaves have been used to create impressions in silver, making these one of a kind pieces uniquely exclusive and a wonderful talking point! 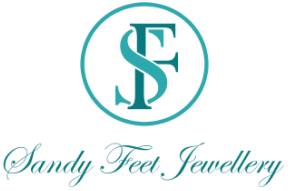 Whether you are looking for a distinctive gift for a special someone or you're treating yourself to something that will express your personality and individuality, Sandy Feet Jewellery has a range of exquisite pieces for you to choose from. And for something totally exceptional, don't forget to talk to us about commissioned works. ​and see what we get up too!